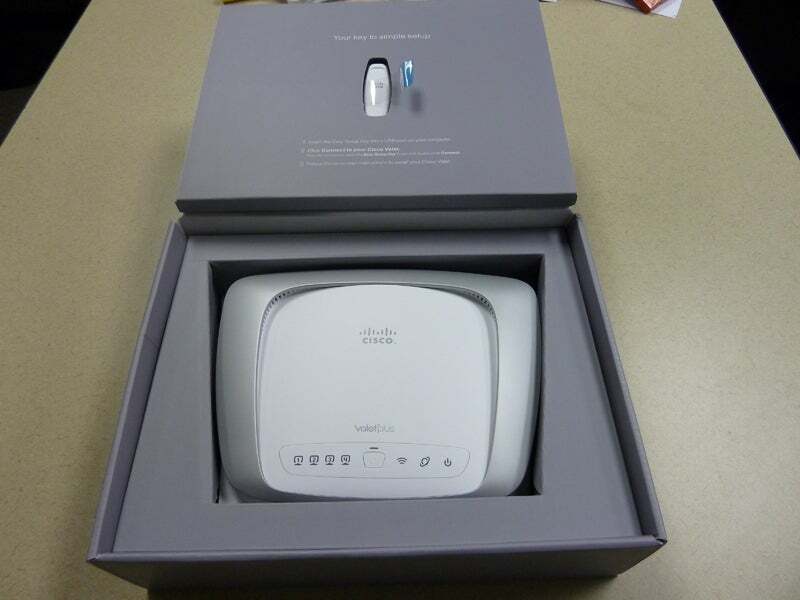 Cisco's new Valet Plus wireless router doesn't promise a whole bunch of fancy features or apps. What it does promise is that you can set it up and have a secure, working wireless Internet connection going in minutes. That's why, when you first open the box, you see a USB thumb drive and a device that looks like a cross behind a Honda Civic and an Apple AirPort Extreme Base Station--and nothing else. Once you take the Valet Plus out of the box, of course, you'll find the ethernet cable and a power cord. 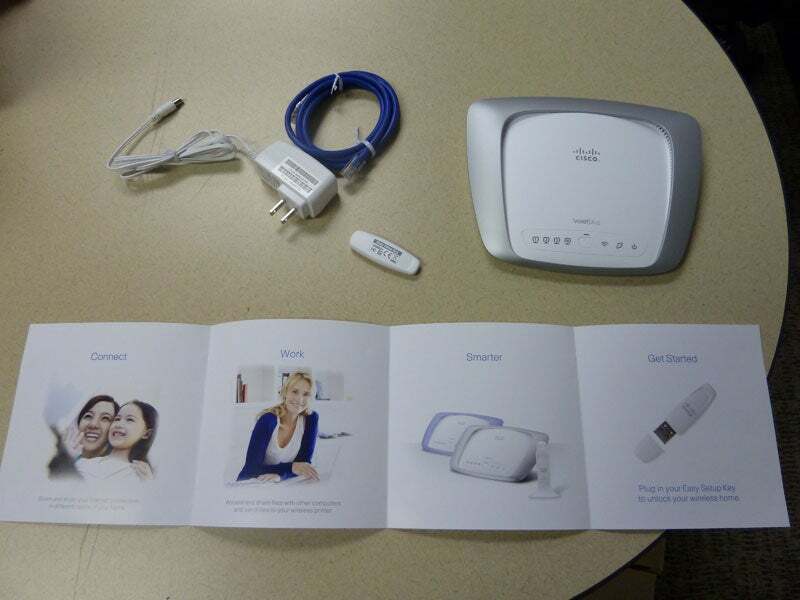 Instead of a manual, you get a small, fold-out pamphlet that shows off all the things you can do with your new wireless router (share files). No complicated instructions, no lengthy disclaimers--it tells you on the inside flap just to stick the USB drive in your PC (or Mac) and go. The Valet Plus is the higher-end cousin of Cisco's Valet router; the main difference between the $100 Valet and the $150 Valet Plus (prices as of March 31, 2010) is the latter's extra radio antenna and gigabit ethernet ports, which make for a stronger signal and faster wired-networking speeds. Otherwise, the features, the setup process, and the software are identical. While the Valet Plus certainly makes setup and configuration easier than your average wireless router does, Cisco's apparent goal was to make the device easy enough for anyone to set up--after all, what's the point of buying a user-friendly router if it isn't friendly enough for people without prior networking experience? So I decided to play the role of PC neophyte and follow the instructions as strictly as possible. 1. Insert the Easy Setup Key into a USB port on your computer. 2. Click Connect to your Cisco Valet. If you do not see this, open the Easy Setup Key folder and double-click Connect. In accordance with the instructions, I started by plugging the Easy Setup Key (the thumb drive) into a USB port. If you're on a Mac, plugging in the thumb drive opens a Finder window with an inviting Home icon labeled 'Connect to your Cisco Valet', just as the instructions indicate. My Windows 7 laptop, however, merely asked me if I wanted to browse the files in Windows Explorer (as it does with any removable media). When the window opened, it showed a bunch of cryptically named files, including the invisible files for the Mac file system (like .Trashes and whatnot), as well as the real documentation--an 18MB PDF that mostly covers the Web-based interface configuration options. To Cisco's credit, the instructions do say (in smaller print) that if you don't see 'Connect to your Cisco Valet', you should open the Easy Setup Key folder and click Connect. It really means that users should click Connect.exe. Once I opened the Cisco Connect app, the setup process was pretty easy: It told me to plug the Internet cable (Internet cable?) from my modem (what's a modem, again?) into the Internet port, to plug the power cable into an electrical outlet, and then to click Next. From there, the app handled all of the basic configuration--I just waited for a few minutes, and I was connected to the Internet on my very own 802.11n, WPA2-encrypted Wi-Fi network. Had I stopped there, I would have already configured a functioning, encrypted wireless network good enough for most home networking needs, complete with a separate network with its own SSID for guest access (so visitors wishing to use their smartphones or laptops could have unencrypted but passworded Internet access without seeing the rest of the devices on my network). If I wanted to add more PCs to my network, I could just plug in the Easy Setup Key, and everything else would happen automatically--no control panels or Web interfaces involved. Simple as it is for consumer use, this Easy Setup Key won't replace your office's IT department anytime soon; the Cisco Valet Plus is aimed at home users, and its configuration software really works only on a fairly simple network. When I tried using the Cisco Connect software to set up the Valet Plus on the PCWorld network, it got me a working network/guest setup with Internet access, but I couldn't change anything (not even the network name or password) in the Connect tool--just as the Cisco reps warned me when they gave me the review unit. The Cisco Connect app also gives you access to a handful of features that make wireless networking easier in a family environment. While the Easy Setup Key idea is a great way to add new PCs onto the network, a truly novice user would be in big trouble if that little drive ever went missing. Fortunately, you can back up your settings to make a new Easy Setup Key (using your own USB flash drive), and if you don't have one handy it'll walk you through connecting via Windows' control panel. The Valet Plus also includes Safe Browsing Mode, which warns you when you're about to visit sites that might be hosting malware or other nasty stuff (while I was using it, the only sites that set it off were Web proxies, but your mileage may vary). You'll also find a solid set of parental controls that let you designate content filters (the presets are for teenagers and children, though you can manually add sites to the list) and acceptable Internet access hours on weekdays and weekends. Since you can set the parental controls for each individual device on your network, you don't have to set blanket permissions across the network. Of course, the parental controls aren't perfect--while the content filters worked well on my laptop, my iPod Touch was able to access all kinds of not-so-family-friendly material despite the settings. Though the Valet Plus allows you to do plenty through the friendly Cisco Connect application, there are certain tasks for which you'll need the Web-based interface. The Web-based interface isn't particularly user-friendly, probably because Cisco assumes that you're digging around there only if you already know what to do. If you need to configure VPN passthrough, port forwarding, Quality of Service rules, or any other advanced Wi-Fi features, the Valet Plus won't hold your hand. This is probably the Valet Plus's biggest missed opportunity; while the router is easy enough for a relatively inexperienced user to set up, features such as QoS remain hard to set up, even though they can make the operation of your home network substantially smoother. The same goes for port forwarding--the novice who sets up the Valet Plus probably isn't going to know that they need to forward certain ports to make Xbox Live or PlayStation Network function properly, much less how to do it in the Web configuration screens. Cisco's Valet Plus is a step in the right direction--it's a solid 802.11n router with a streamlined setup process and a handful of useful features that don't require a networking certification to set up. However, "easier to use" isn't the same as "easy to use." Here's hoping the next iteration goes just a little bit further.